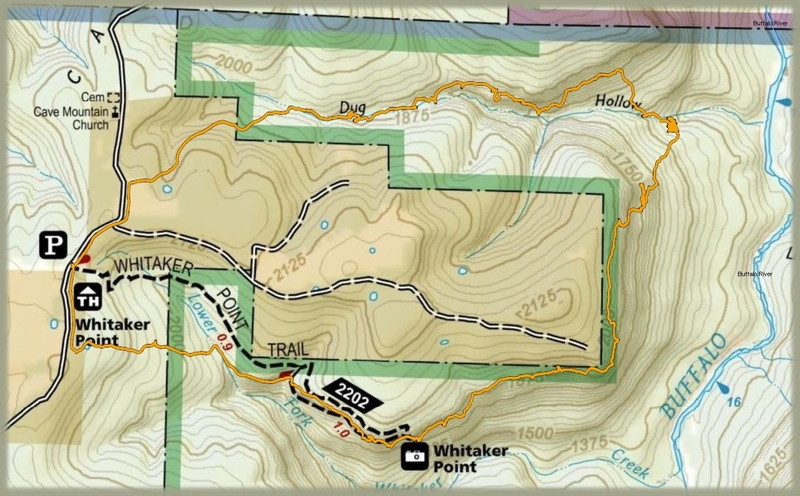 This hike involves Dug Hollow and the bluff line above Whitaker Creek where the Hawksbill Crag resides. 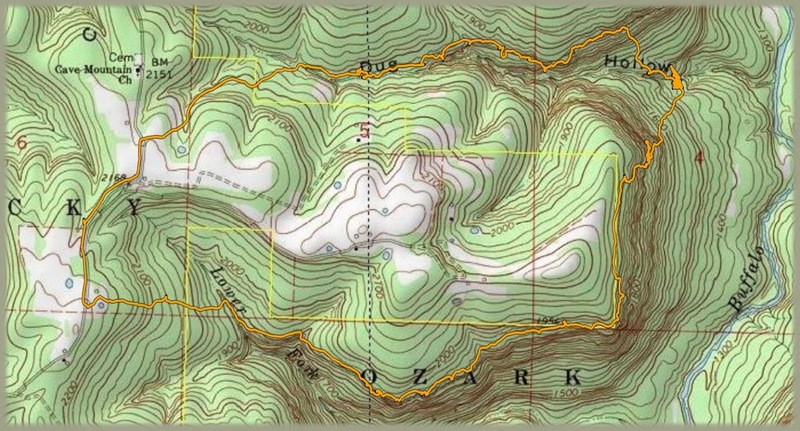 I arrived at the Hawksbill Crag access at 4:30 Thursday afternoon and made my way north on Cave Mountain Road to where I could drop down into the holler. The afternoon was mostly cloudy and 78 degrees. I fear I had to cross some private property to get to where I was going but that's the price you pay to own land on the edge of a wilderness area. The creek was typical for these parts until it hit the bluff line and plunged over a series of...maybe 6 waterfalls. Ordinarily this would have been a special place but it was so choked with deadfall that I did not even bother to take any photos. There was a trace of a trail along the north side of the creek that followed the top of the bluff line so I proceeded to follow it. There was eventually a break in the bluff that allowed descending into the creek bed...which was quite boulder strewn. Daylight was running short so the first decent campsite was grabbed just ten feet above the creek. I secured my hammock and decided not to build a fire that night. As night fell the sky cleared and filled with the usual stars with no moon. There were huge mosquitos but not a tick was ever seen. Sitting in the dark without a fire is not much fun...especially without a moon....but I kept busy till around 9:00 when I crawled into my hammock with built-in bug netting. This was the first time for me to sleep in a hammock, but found it to be quite comfy. I have carried an old mesh hammock from way back in the 70's to lounge in but have never tried to actually sleep in one. I was pleasantly surprised. I had bought this one to use in the summer....so will see how it works out. I rose at 6:30, broke camp and headed uphill towards the bluffs. It took a bit to find a way up the cliffs but finally did. 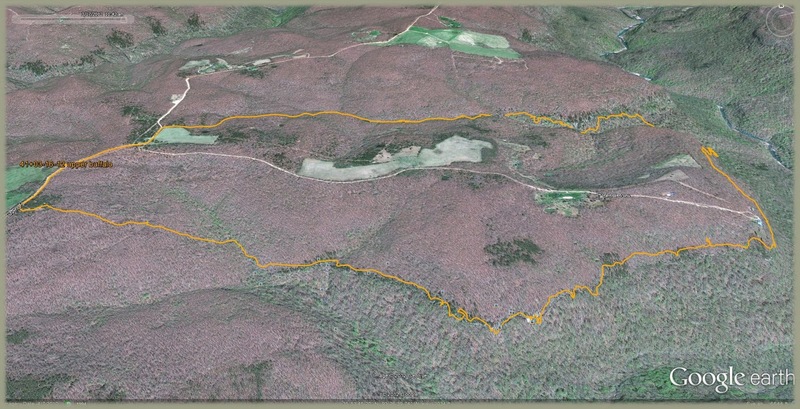 I made my way around the mountain to the bluff line that follows Whitaker Creek. The sun did not come up over the river until around 7:40. The temp in the valley was 57 but rose to 67 at the top....and it was quite humid. Rounding the corner from the Buffalo to Whitaker Creek I passed just beneath Tim's house and witnessed just what a fantastic view he rises to each day. There was a nice trail from here to Hawksbill Crag and I had the place to myself when I arrived. I spent some time here and relaxed and ate some snackage. The amazing thing about this bluff line is all the large boulders that are perched on the edge...some balanced just right. I then headed down the trail towards the road and was following the bluff and managed to lose the trail so I cut through the woods. The vehicle was in view by noon. I headed north and pulled off the gravel road a little ways before connecting to the highway and discovered a cool bluff overlook that viewed the entire Buffalo valley looking north ,south and east.....never knew this was there. To Jasper for some pie and coffee and then to Haw Creek and Big Piney Creek.